NFL free agency is all about value. Anyone in the NFL can spend money, but good organizations succeed in the marketplace by identifying players who will produce more value than their contractual demands suggest; in other words, guys who are better than everybody else realizes. That might evoke images of teams signing guys for pennies on the dollar before they turn into stars, but teams don’t necessarily have to be cheapskates to find value. The Saints shelled out a huge contract to Drew Brees in 2005, but they obviously got their $60 million worth over the course of the ensuing six seasons. A good general manager plows into free agency and finds players that fit his team’s holes before signing them at a market price below their “true” value. The job of an agent is diametrically opposed to that of a general manager. The agents’ job, of course, is to make the players they represent look as valuable as possible. That doesn’t necessarily mean wildly distorting a player’s abilities — nobody’s going to buy that Marion Barber is worth $40 million — but it does involve creating the best possible context for their player. A good agent not only creates demand, he creates doubt in the heads of general managers by convincing them that the player they’re trying to sign is worth more than the GM’s valuation. As part of our preview of this year’s free agency period, we’re going to approach the market from an agent’s perspective. You may be familiar with the “books” that baseball mega-agent Scott Boras prepares for his top free agents, binders with page after page of arguments detailing why Alex Rodriguez or Prince Fielder deserves a $200 million contract. Football agents, as you might expect, prepare similar sorts of packets for their players. Well, all this week, we’re going to step into the shoes of those agents. We don’t have the time, staff, or obvious financial motivations of someone like Boras to prepare a 72-page document for a player, but we’re going to prepare abbreviated “books” for five of the NFL’s most interesting restricted and unrestricted free agents. While we often use statistics to try to get accurate gauges of a player’s value or performance, that’s not going to be our goal here. Instead, these books will attempt to make each player look as valuable as possible, even if we don’t truly believe that the player is actually worth as much as the books suggest. 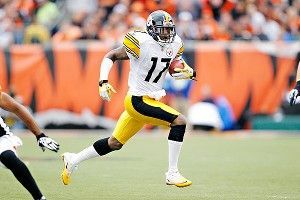 Today, we start with explosive Steelers wideout Mike Wallace. See? We’ve already started talking these guys up. We’re basically agents already. And where did these six cell phones come from? At 25, Mike Wallace is the most promising young receiver in all of football. He’s accomplished more during his first three years in the league than any other wide receiver in recent memory, despite unfavorable conditions, regular absences from his starting quarterback, and the presence of two of the league’s most decorated wide receivers ahead of him on the depth chart when he entered the league. Any team lucky enough to have Mike Wallace on its roster can expect to have the best wideout in football in its uniform for the next several seasons. • Among active wideouts, Wallace’s 3,206 receiving yards are the second-most accrued during a player’s first three seasons, behind only Anquan Boldin. • Among receivers with a total of 60 receptions or more during their first three seasons, Wallace has averaged more yards per catch. • He’s scored 24 touchdowns in his first three seasons, more than any other receiver in football besides Braylon Edwards. Only two receivers in the past 30 years have gained more receiving yards and scored more touchdowns during their first three years than Wallace, and they make for pretty good company: Randy Moss and Jerry Rice. Could He Be Better Elsewhere? In addition to his impressive performance, there are reasons to think that Wallace’s statistics might understate his true level of performance. While Wallace has made it through every contest in his 48-game career without missing a game and has yet to be placed on the injury report with an ailment that classified him as “Questionable” or “Doubtful,” that hasn’t always been true of his quarterback. Ben Roethlisberger missed one game during the 2009 season and another during the 2011 season thanks to injury; beyond those absences, Roethlisberger was a dramatically limited player during two other 2011 games because of his high ankle sprain, and was suspended for the first four games of the 2010 season. Furthermore, if you take Wallace’s statistics with a healthy Roethlisberger and prorate them to a full 48-game career, he would have 3,403 receiving yards and 26 touchdowns, which would give him more receiving yards and touchdowns than anybody selected in the draft during this millennium. During Wallace’s tenure with the Steelers, he’s also been part of a team that’s played at a very slow pace. In fact, last year, Pittsburgh’s offense only ran 165 possessions, the lowest total in football. Fewer possessions, of course, mean fewer chances to rack up totals. Compare that to the Jets, who had 198 possessions to work with over the course of their season; receivers on the Jets got 33 more possessions to work with, or nearly 20 percent of Pittsburgh’s entire total. If you take Wallace’s statistics from 2011 and adjust them for a 198-possession rate, he finishes with 1,431 receiving yards, improving his total from 11th in the league to fourth. In addition, while other players get to pad their statistics by making plays and picking up meaningless yardage in garbage time, Wallace has rarely enjoyed such a luxury during his time with the Steelers. Over his first three seasons, just 7 percent of Wallace’s receptions have come while his team trailed by 14 or more points. The league average for receivers is just under 16 percent, and similarly skilled players on subpar teams get even higher; Larry Fitzgerald has accrued nearly 19 percent of his receptions in those scenarios. Wallace’s production has come when it’s mattered most to his team, to an extent that virtually no other player in football can match. If Wallace plays on a team with a healthier quarterback that moves the ball up and down the field at even a league-average pace, his performance will improve beyond his already impressive rates. When Mike Wallace entered the league in 2009, he had little claim to regular playing time. The Steelers were coming off a win in Super Bowl XLIII, and their starting receivers were a pair of Super Bowl MVPs: Hines Ward and Santonio Holmes. Wallace was also behind Limas Sweed, whom the Steelers had chosen in the second round of the previous year’s draft. Wallace quickly beat out Sweed for the third wideout job in training camp, and less than two years later, he was Pittsburgh’s no. 1 receiver in the Super Bowl. The disparity between their performances is obvious, but it stretches even further when you remember the difference in possessions between the two teams; even though Holmes missed four games of the 2010 campaign because of a suspension, he’s still seen action on more drives than Wallace has over the past two years. And Wallace is also playing at this superior level of performance while he’s two years younger than Holmes. Wallace has clearly been the superior player to last year’s free agent catch, and he should only continue to get better over the next several seasons. Very simply, the chance to acquire a 25-year-old receiver with this sort of electric skills and proven track record of production does not come around frequently, if ever. Imagine that your organization could have signed Jerry Rice or Randy Moss to a contract three years into their careers while merely sacrificing a first-round pick. On the rare occasions when players of this ilk become available, they usually have baggage of some nature attached and require far more than a first-round pick. There is no such baggage surrounding Wallace, and because of Pittsburgh’s salary cap situation, the league has been presented with a chance to acquire him for a price far below his true market value. Mike Wallace isn’t just a free agent. He’s a once-in-a-generation opportunity.